We all love Picasso. Museu Picasso is one of the most visitited in Barcelona and we don’t miss any exhibition placed there. We are also food lovers and the current exhibition mixes art and kitchen. Curated by Emmanuel Guigon, Director of the Museu Picasso, Claustre Rafart, conservator of graphic works at the Museu Picasso, and Androula Michael, lecturer in contemporary art at the Université de Picardie Jules Verne, this exceptional exhibition at the Museu Picasso in Barcelona brings together more than 180 artworks, among which there are paintings, sculptures, prints and drawings from various periods of Picasso’s oeuvre, as well as a selection of documents and photographs. The stars of the show are the kitchen, utensils and food. It also has a room, called Mauri room entirely dedicated to contemporary art. For this exhibition, it host an intervention by the famous catalan chef Ferran Adrià. 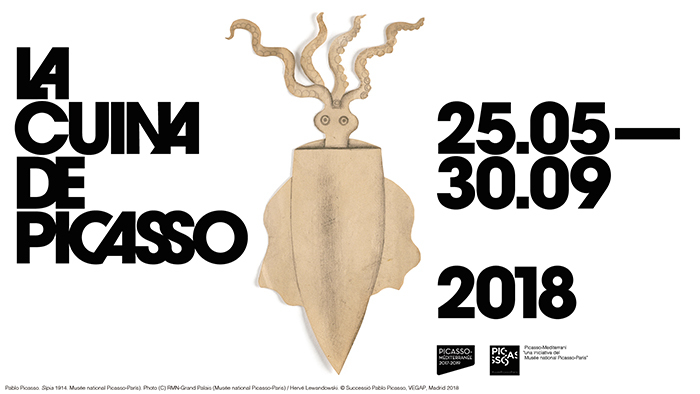 The exhibition is open util the 30th of September and you can here some information about the exhibition and about the Picasso Museum! 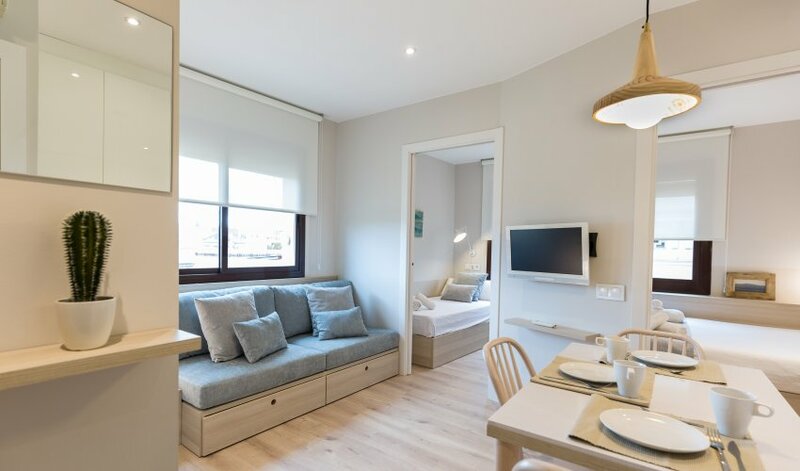 Super cozy and just renovated studio with a fresh style next to the beach area and Born with rooftop terrace and chill out area overlooking Barcelona. Stylish, very bright and great located along with other 17 apartments in Barcelona in the same building. This is the perfect spot if you come to study, work or just spend some time in Barcelona. The apartment is really quiet and comfortable. A unique space with views towards the cosy square behind Estacio de França. Twin beds in the sleeping area, and spacious bathroom with large shower. There is a full and modern equipped kitchen opened to the living room. We provide bed linens and towels included in the rent and there is the possibility to offer weekly cleaning under request. These apartments in Barcelona and the building also includes: air conditioning, free Wi-fi, elevator and an amazing roof terrace with chillout area, a shower and 360º overview of Barcelona. Two bedroom apartment in beach area. Stylish, very bright and great located accommodation Barcelona along with other 17 apartments in the same building. This is the perfect spot if you come to study, work or just spend some time in Barcelona. The apartment is really quiet and comfortable. A unique space with views towards the cosy square behind Estacio de França. One doble and one single bedroom, and spacious bathroom with large shower. There is a full and modern equipped kitchen opened to the living room. We provide bed linens and towels included in the rent and there is the possibility to offer weekly cleaning under request. These accommodation Barcelona also includes: air conditioning, free Wi-fi, elevator and an amazing roof terrace with chillout area, a shower and 360º overview of Barcelona. Charming one bedroom in the heart of Gothic. 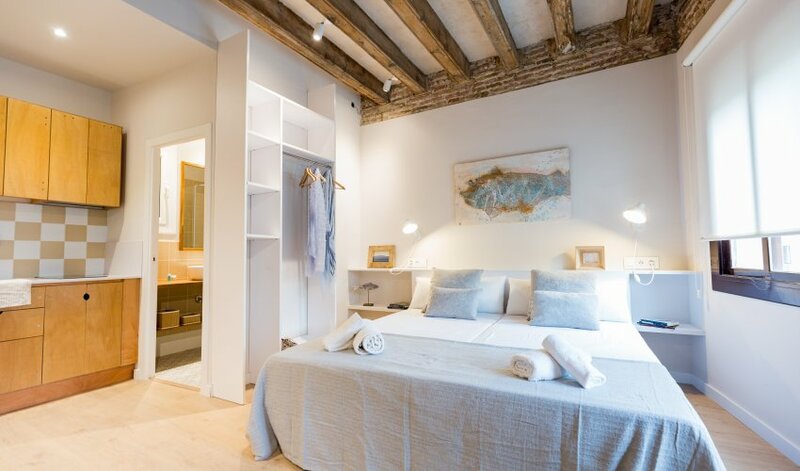 Fabulous apartment in a privileged area in Barcelona’s historic Gothic Quarter. 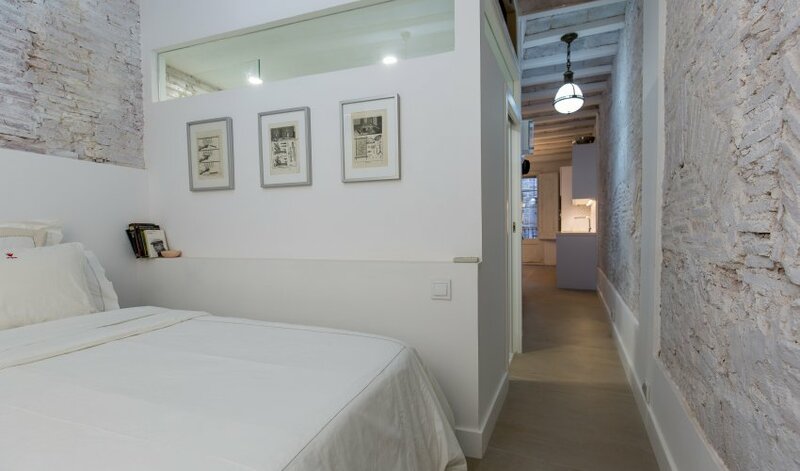 The best place to stay in Barcelona for couples. This apartment is a great living space with earthly colors, traditional rugged brick walls and vintage doors with a slick modern interior. The sleeping area is a cozy little space of comfort and intimacy, featuring a double bed and a very practical closet. The largest room could be used as both, a living room with a sofa bed where you can relax, and a fully equipped kitchen to make your favourite plates come to life. In addition, from this room you will have access to a small but charming balcony overlooking the historic district. The area where the holiday apartment is located, is close to both El Born with its unique mix of independent shops, restaurants and bars, and the prestigious Passeig de Gràcia, where many leading international luxury brands have stores. The closest metro station is Jaume I, 4 line.